I found my dish in the clearance section last year for a couple dollars, but you can also find them in thrift stores quite frequently. 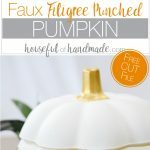 I am sharing the cut file for this filigree punched ceramic pumpkin in my subscriber library. Click here to subscribe to my weekly newsletter and gain access to all the freebies. If you already have your password, click here to download it. I used Oracle 631 vinyl so it was easier to remove. Start by cleaning the outside of the glass pumpkin to remove any oils and residue. I like to do this with a cotton ball and rubbing alcohol. 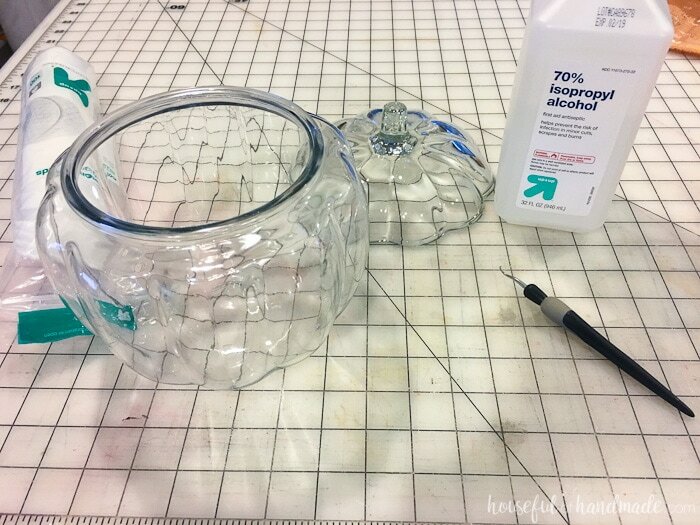 The rubbing alcohol will evaporate and leave no residue on the glass. Resize the filigree design to match your pumpkins or design your own in Silhouette Studio. Since my pumpkin had 10 bumps around the perimeter, I designed it to have 5 filigree design sections, each one fitting over 2 bumps. Cut the design out with vinyl. 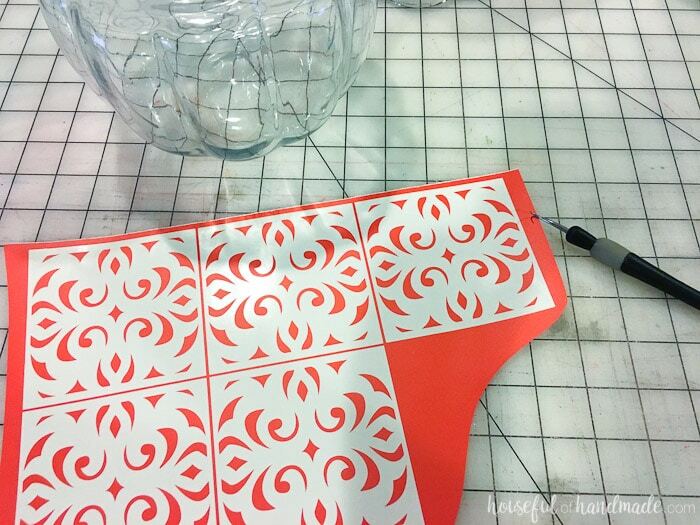 Remove the center part of the filigree design. 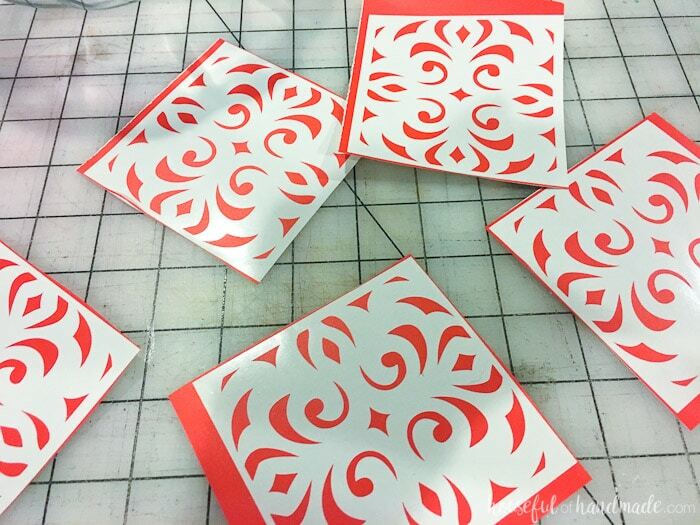 Cut apart the filigree sections. Using transfer tape, To remove the vinyl from the backing. 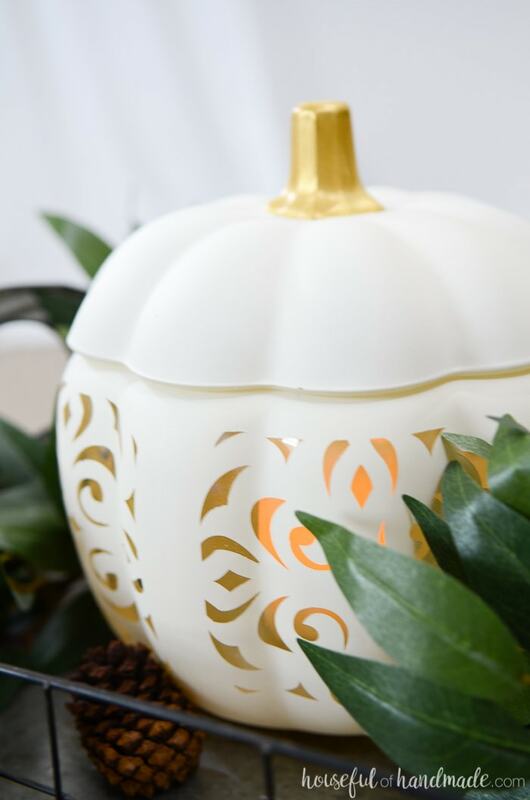 Transfer the vinyl filigree design to the cleaned glass pumpkin. 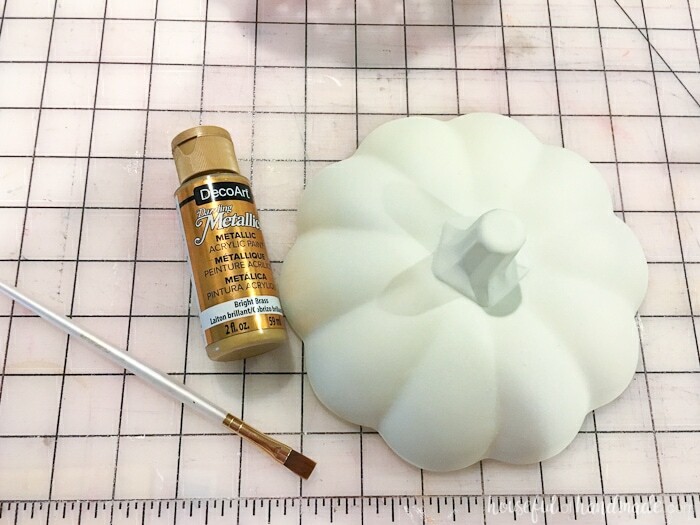 Don’t stress about keeping the transfer tape smooth over the curved surface of the pumpkin because it will be impossible. Just focus on keeping the vinyl pieces smooth against the surface. Remove the transfer tape. Finish up with the remaining filigree sections. 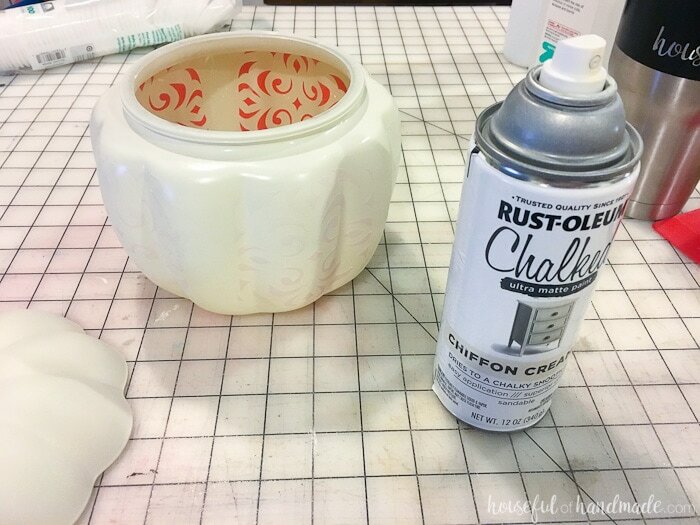 Then cover the entire pumpkin with a few even coats of the chalky finish spray paint. I love the chalky finish because it has no sheen to it and makes the glass look just like ceramic. Let the paint dry to the touch, but do not wait too long or the paint will peel off when you peel off the vinyl pieces. Carefully peel away all the pieces. I find it is easiest to do with a pin. 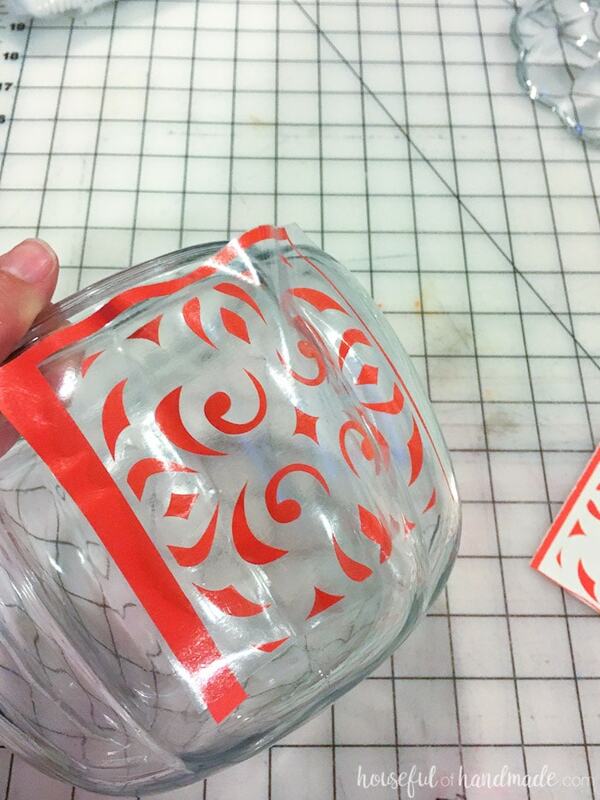 Stab the center of the vinyl piece with the pin and pull it away from the glass. 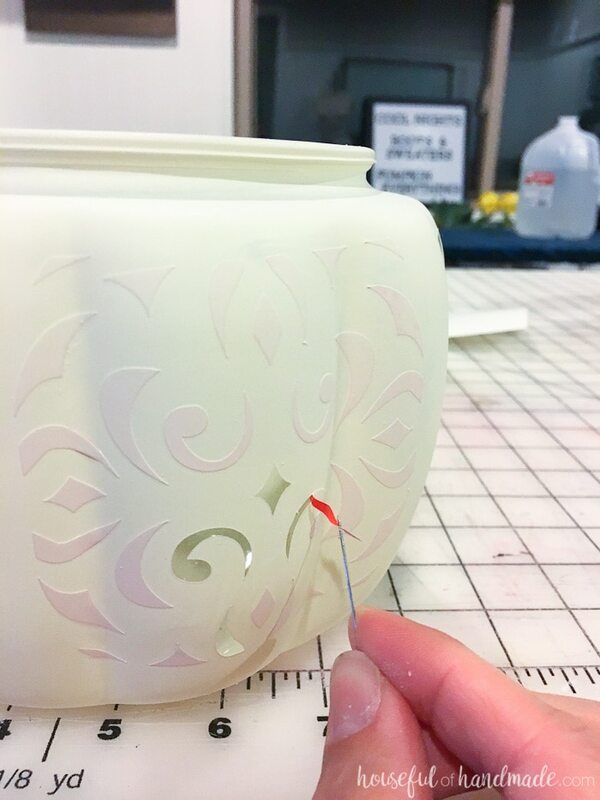 To give the lid a finished look, paint the stem with a metallic acrylic paint. It took 2-3 coats to get complete coverage. Then all that is left is to decide where you are going to display your new high end pumpkins! I knew exactly where I wanted to put mine. I needed a new vignette for my coffee table for fall and it seemed like the perfect place for it. Boy was I right! 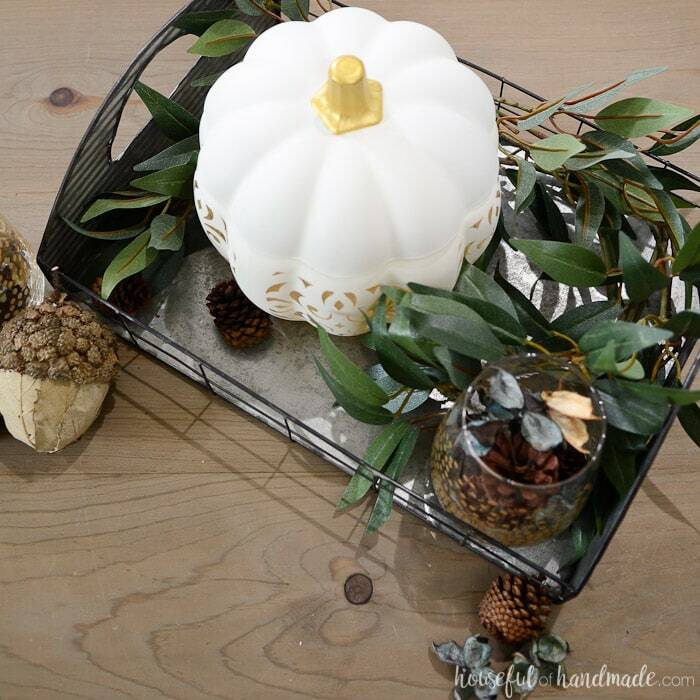 For more fall decor, make sure to check out the rest of my DIY holiday decor. 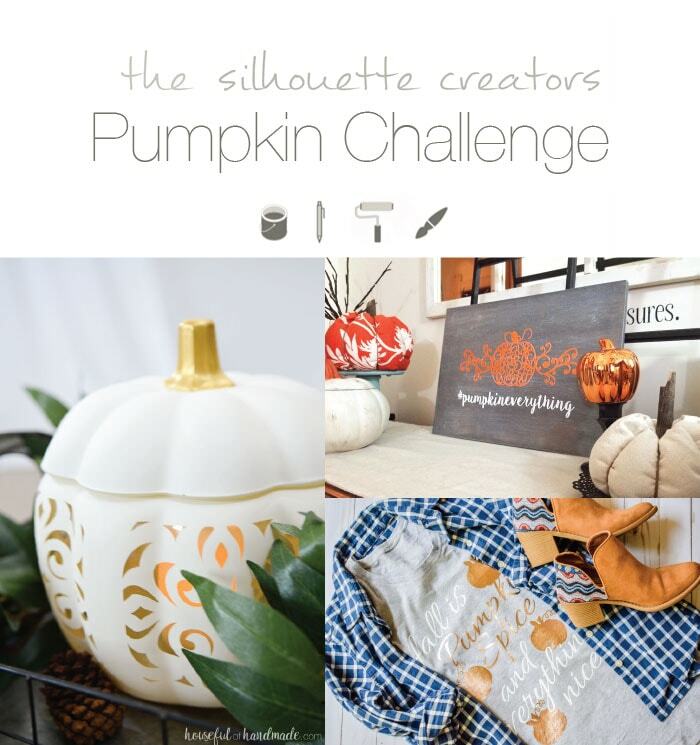 And don’t forget to check out these other awesome pumpkin projects you can make with your Silhouette Cameo this fall! Wow! This is beautiful. I love that you found a way to recreate a look you love for a much cheaper price tag and made it look pretty as well. Thank you Michelle! I love that it cost so much less too, but is still so beautiful. I love this! I am an email subscriber, but I don’t have the password for the pattern download. How do I get that? Oops, never mind… I see it now :). Glad you found it! Happy crafting. WOW, you have amazing ideas. Pumpkin is a WOW!! Thanks so much Linda! I love how this pumpkin turned out.